I haven’t been doing too much knitting the past several days. Busy busy busy with trips to the junkyard and cooking and such. I miss it. Hope to have some knitting time today. You know, when I’m at the dentist for 50 hours getting a crown replaced and two fillings re-worked. In the meantime, you will get some posts about what I’ve been cooking. As the garden is winding down – except for the eggplant which just started flowering two weeks ago, has a million flowers and apparently only one eggplant at a time will grow – I’m finding ways to use everything I’m harvesting. Or finding people to give it away to, as is the case of my cabbage. Really, there is only so much cabbage two people can eat. I grew 6 heads of cabbage, one of which just doesn’t look right, so that won’t be eaten. Earlier in the season, some sort of bug got to the outer leaves and they looked like swiss cheese. Being so busy, I didn’t have time to figure out how to address the problem, so I just let it go. Turns out, if you just let it go, sometimes it works out. Five heads of perfectly good cabbage, with just the outer leaves swiss cheesed. One head became coleslaw. (no picture) One head was given to my mother-in-law. One head is not harvested yet. And the last head became stuffed cabbage! 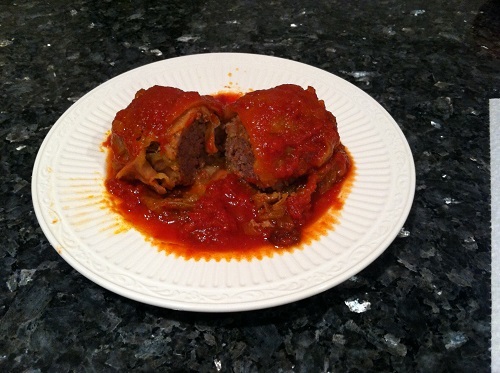 I got my Stuffed Cabbage recipe (click there to see it) from the Barefoot Contessa, aka Ina Garten. I love Ina. I’m sure I’ve said it here before. I just love her. I love her recipes, I love her cooking show, I love her house/gardens/huge “barn”-turned-other-kitchen. I like her almost as much as I like Martha. The recipe was very yummy. A little time consuming – you have to boil a big pot of water and submerged the head of cabbage for a minute or two, take it out, peel off some leaves, put it back in to soften the next layer, and so on. And you are supposed to make sure they are soft, but not too soft. 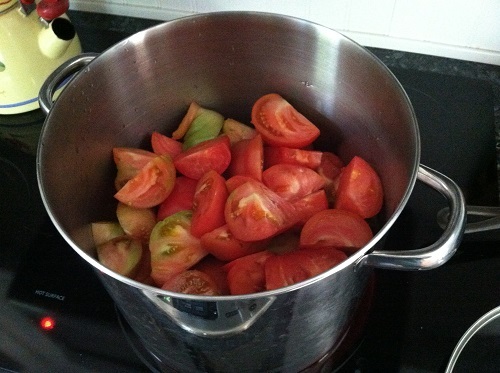 I didn’t have as many tomato plants as last year, so the processing time was much shorter this year. One day, 10 cups of puree, to be later enhanced with spices and reduced into sauce. 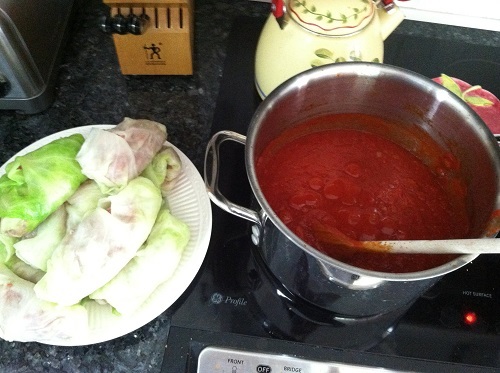 Back to the stuffed cabbage sauce. It was a sweet sauce, containing brown sugar and raisins. It tastes much better than that sounds, trust me. I know, this picture doesn’t tell you much. 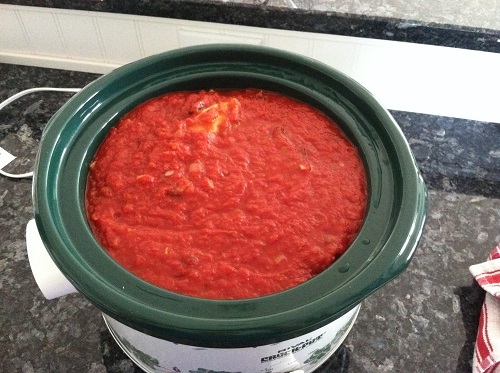 Looks like sauce, with a little piece of cabbage poking out. 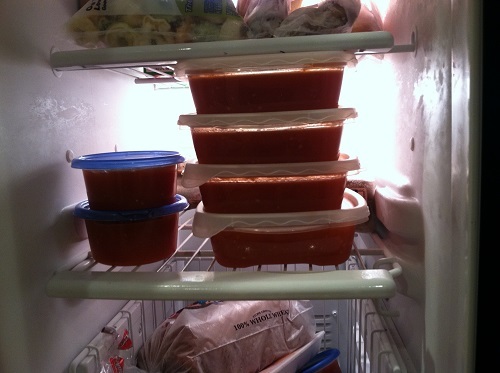 But there are 12 cabbage rolls in there. So, this is where I diverged from the recipe, since Ina’s calls for you to bake it in the oven for an hour. But we weren’t going to eat ours until later, so I put it in the crock pot on low for 6 hours on low (a couple hours in the beginning were on high because I’m paranoid about making sure it is cooked). Really really yummy. Kind of a one pot meal. I think we ate it with some rolls. A couple more recipes to come…. Do you have a garden? What are you making with your harvest? Posted in Uncategorized on September 16, 2013 by lizytish.